Call Us Today for All Your Home Remodeling Needs! With over 36 years in the industry, Ramsey Construction Inc is a residential contractor you can rely on to complete your home improvement, home remodeling or condominium remodeling project with integrity and pride. We are a family owned and operated company serving Cocoa, FL and the surrounding areas. Our goal is to work with our customers to provide quality service and deliver the remodeling results they envisioned. We Are the Commercial Contractor for You! As an experienced professional commercial and residential contractor, we will work with you every step of the way in choosing the right design that fits your needs and your budget. Ramsey Construction Inc's professionals will ensure your project reaches its fullest potential with smart updates, careful planning, and perfect execution. Regardless of the industry, every business needs a place to perform and maintain its operations. At Ramsey Construction Inc, our commercial contractors believe that quality office buildings play a part in helping a business achieve its full operational potential. We also believe in maintaining sustainability throughout the life of a building in the Cocoa, FL area. Our commercial contractors are proud to design environmentally friendly, sustainable, and high performing buildings to help achieve significant savings during the building’s life cycle. Ramsey Construction Inc. provides affordable and exquisite designs for all home and commercial construction projects, including condominium remodeling. Whether you prefer traditional, contemporary or transitional designs, Ramsey Construction Inc has what you need. It's important to choose a commercial contractor that you can trust. When you call Ramsey Construction Inc, you can trust that you're getting the best home improvement services in Cocoa, FL. We are committed to providing prompt, reliable, reasonably priced service that you can trust to last. Call us today to discuss your construction or remodeling ideas. We'll work hard to bring your vision to life! Ramsey Construction Inc's goal is ultimate client satisfaction. We strive to ensure you are comfortable and happy from our initial meeting to project completion. We'll make sure you understand the details about how your construction project should be carried out before we get started. We'll also keep you informed about the progress of the construction project, and if you have questions, we're here to help! Ramsey Construction Inc projects are performed in a professional and timely manner. We understand that no one wants to see their home or business in an ongoing state of construction, so we work to get things done as soon as possible. Our Professional Home Inspection Division performs comprehensive home and commercial inspections, often helping to ease insurance premiums. Call today and ask us about Wind Mitigation and Four Point Inspections for your property. 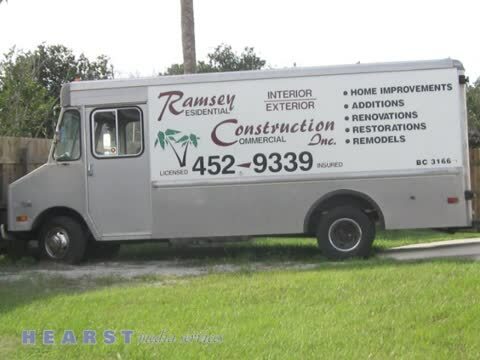 Ramsey Construction Inc has been in business since 1989 - over 30 years - and serves the following locations: Cocoa, FL, Cocoa Beach, Titusville, Merritt Island, Rockledge, Melbourne, Satellite Beach, Indialantic, Melbourne Beach, Viera and Suntree. We are Brevard's top residential and commercial contractors and home remodeling specialists and we welcome the opportunity to serve you. Ask us more about our condominium remodeling! Commercial & Residential Building, Home Improvement, Restoration, Rehabilitation, Remodeling & Home Inspections, Drywall, Soffit & Fascia, Siding, Stucco, Roofing, Cabinets, Painting, Decks, Doors & Windows, Hardwood Flooring, Tile & More, Contractor. We take great pride in our affordable and exquisite designs for all home and commercial projects. Whether you prefer traditional, contemporary or transitional designs, call Ramsey today.